Welcome to the Village of Port Dickinson! 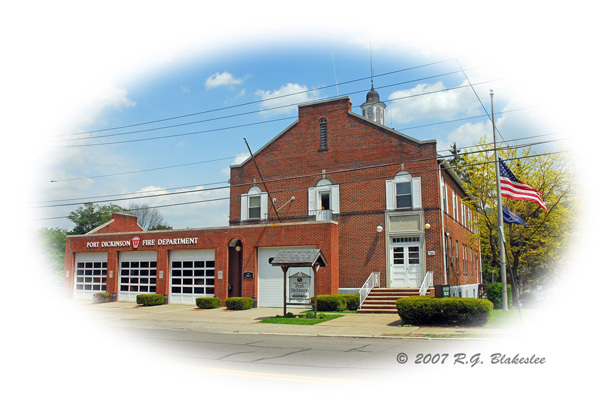 If you are not familiar with our Village, we lie within the town of Dickinson, north of the city of Binghamton, in Broome County. We have developed this website as a source of information for our residents. If you need to pay your taxes or your water/sewer bill you can do that here. We have information about our village meetings, parks, history, and budget reports. If you’re looking for a building permit application visit our Downloadable Forms Page. Need information about surrounding services? Visit our Useful Local Links Page. When we have special announcements for the village they will be posted on our home page in the Announcements section. If you have any questions or would like more information about the village please contact us via the contact information below. Monday, May 13, 2019 – The Village will begin hydrant flushing. It may take 2 or 3 days to complete. Fenton will be flushing Hillcrest water lines the previous week, starting Monday, May 6, and continuing most of the week. There is a small chance of some water discoloration in the Village during both weeks. During the months of April and May, Public Works will pickup grass clippings with the normal Tuesday lawn debris pickup. This is due to the increased growth of grass during the early Spring and rainy season. Lawn Debris pickup, including grass, will begin 4/2/19. Grass clipping collection will end 5/28/19. Lawn debris collection will continue until 10/29/19. © 2018 Village of Port Dickinson, N.Y.